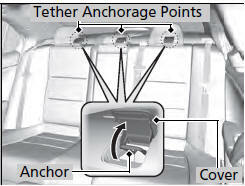 A tether anchorage point is provided behind each rear seating position. A child seat that is installed with a seat belt and comes with a tether can use the tether for additional security. 1. 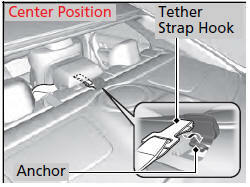 Locate the appropriate tether anchorage point and lift the cover. 2. Raise the head restraint to its highest position, then route the tether strap through the head restraint legs. Make sure the strap is not twisted. 3. 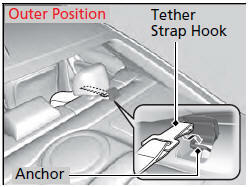 Secure the tether strap hook onto the anchor. 4. Tighten the tether strap as instructed by the child seat manufacturer. Since a tether can provide additional security to the lap/shoulder seat belt installation, we recommend using a tether whenever one is available.